On Sunday, former world and Olympic champion gymnast Shawn Johnson, 20, retired from gymnastics. Citing a bum knee, she withdrew from this coming weekend's national championships, the first competitive step towards the 2012 Olympic team. Johnson is probably best remembered for her smiley persona and her epic all-around showdown with the willowy Nastia Liukin, the daughter of Soviet champion Valeri. Liukin beat Johnson for the gold in Beijing, 63.325 to 62.725, but the difference between them was measured in more than start values and points earned. It was a rivalry characterized in terms of darkness versus light, force versus grace, a "little ball of power," as The New York Times put it, versus "the flexibility of a prima ballerina." Jock versus artist. Shawn Johnson, for all of her talents and abilities, was never considered an artist. Last month at the Olympic Media Summit in Dallas, she obliquely indicated why this might be. She was talking about weight loss and body shape, in terms usually reserved for the covers of celebrity magazines. Since Beijing, she said, she had gained and lost about 25 pounds from her 4-foot-9 frame. At her heaviest, when she stopped full-time training and allowed herself to eat typical teenage fare like ice cream and pizza, she received brutal criticism from fans, especially on the sport's message boards, and from the tabloids. "That whole process kind of broke me down and taught me something," Johnson said. "People put too much emphasis on looks." Most of the time, nowadays, that emphasis isn't so openly expressed. Instead, it's coded, by labeling certain gymnasts—the lithe ones, the ones who aren't built like Johnson—as artistic. In theory, artistry should describe a quality of movement, a connection between the performer's limbs, the music, and the audience. But somehow, the short, stocky gymnasts like Johnson rarely get credit for that je ne sais quoi. "In America, we'll score the stocky, athletic builds normally," 1996 Olympic gold medalist Dominique Dawes said, in response to Johnson's comments. "Internationally, there still remains a stigma to that type of body type." Given Johnson's success, it's hard to make the case that she has suffered much under-scoring internationally—she won nearly every senior meet she entered in 2007 and 2008—and many similarly built gymnasts have also fared well in competition, including Mary Lou Retton and 1991 World Champion Kim Zmeskal. But Dawes's remark illustrates how the evaluation of performance is still entwined with evaluating gymnasts' bodies. Thankfully, it has become unacceptable to talk directly about the bodies of female gymnasts, most of whom are teenage girls in their prime eating-disorder years. Networks no longer cite competitors' height and weight, a practice that was common until the mid '90s. And USA Gymnastics has worked hard to improve the education and nutrition of its athletes, so that contemporary American gymnasts, for the most part, look like very fit and healthy teenagers, not like underfed nymphets. But the judging and the commentary still favor a long, lithe appearance. Liukin, who has just successfully returned to elite competition after a three-year absence, seems to get an artistic benefit of the doubt. Yet though she strikes dance-y poses in fashion ad campaigns for Max Azria, she also commits grievous errors when it comes to artistry. Her head often doesn't move with the rest of her body as she dances. And though she achieves maximal split on leaps and jumps, her upper body form, meaning her arms, hands and torso, has been described as "claw-like." Johnson didn't try to emulate a ballerina in her routines, but she moved as though she actually heard the music, not as if she could have done it all in silence. Her head and expressions were all connected. She was often cited for lack of flexibility, but the ability to reach and surpass 180 degrees in a split does not an artistic gymnast make. Certainly she was never as disconnected from the music and the audience as present champion Viktoria Komova is. Check out Komova's floor routine at the 2011 World Championships for evidence. Yet Komova is the kind of gymnast of whom NBC's Elfi Schlegel often remarks, "She has a look that international judges love." Plenty of lean, flexible gymnasts have nothing in common with dancers in terms of musicality and interpretation. We call them artistic because we can as easily imagine them in a tutu as in a leotard. Aesthetics is subjective, naturally. And if dance-like qualities were merely the garnish on top of a difficult and technically proficient performance, this would matter far less. But successive codes of points have tried to quantify artistry, to reward "dance" elements because gymnastics labors under the pretense of being "more than." 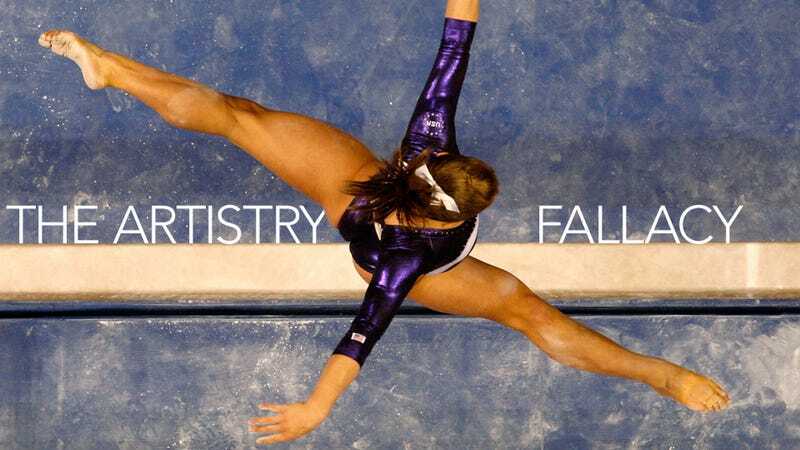 Athletes, fans, coaches, and judges believe that the sport should aspire to be something greater than flips, twists and points on a scoreboard. But it is next to impossible for judges to evaluate and reward this. Nor should they, especially when the scales seem to be tilted toward one style of artistry—the balletic, elegant type—and a resultant body type. Johnson spent her career on the other side of the scales. Even before her weight fluctuations, she says that she never felt right in her body, not even at her athletic pinnacle at the 2008 Olympics, where she won four medals, including the gold on the balance beam. On her espnW blog, she reflected about standing atop the podium with her medal. "Back then I always felt like I could've been a few pounds lighter," she wrote. Then Johnson, predictably, offered the same pabulum about accepting your body and loving yourself. And of course, she would only speak about this after she had repented and lost all of the weight through arduous training and deprivation. Gymnasts, by training, are not dancers. It's unfair to expect a girl who has excelled at the sport because she is fast and strong and powerful and fearless to also be a ballerina. If she competes with proper technique and clean form, then artistry, while nice to watch, is a bonus for viewers, nothing more. Johnson, throughout her career, had few rivals in form and technique. Whether this means she was also artistic is more difficult to assert. Gymnastic artistry is like the old characterization of "obscenity"—you know it when you see it. Since she will no longer be competing, I suppose that this leaves the final judgment to her fans and the thousands of young gymnasts who looked up to her for her athleticism, competitiveness, and perhaps even for her artistry.